We’re entering a month in which Veterans Day will be celebrated with additional ceremony, because the 11th will be the 100th anniversary of the ending of the first world war. Earlier in the blog I remarked that World War 1 was the last war which was substantially narrated to us by poets. That’s so for a complex set of reasons. Modernism, arising before the outbreak of the war, sought to revive a fresh poetry shorn of worn-out imagery and obligatory practices. The war brought both the old poetry and the new Modernist ideas into a great deadly laboratory to test their efficacy. The comfort of the old poetic music survived this test, but it was gravely wounded. The new practices were not exactly proved either, such was the horror and absurdity of the war. Indeed, the post war Modernism that came out the other end of the war’s meat grinder was oddly often much more obscure and seeking after esoteric tactics. To a large degree, the post-WWI era marks an off-ramp for poetry. 20th century poetry emphasized the language of aesthetics and philosophy that might employ music to sweeten its sound, rather than the music of words that might employ philosophy as one of its harmonies. Eventually, by our current century, it turned again, and it is now largely about memoir and the establishment and explanation of personal identity. World War 1 broke poetry, and in it’s wake, the Modernists ascendant decided the shards better reflected reality than some dusty Grecian Urn. If one sets aside modern literary poetry, the old poetry still survives. One place you might find it is in the library that some carry about in their heads: memorized poetry. How rare is that today? I cannot say, but I can recall late in the last century, observing Garrison Keillor offering some prize (an autographed book? a T-shirt? I can’t recall the exact prize) to anyone in an admiring crowd who could recite a poem of more than 8 lines. I recall no one taking him up on that offer. Poetry started with those libraries in our heads, and we have the Iliad, the Odyssey and other ancient poetic epics because of prodigious memorization before writing. It isn’t just the noise from our glowing palm screens, or giant TVs that numbed this out of us, it started with the silent racket of all those printed books that call us to read them. Memorization seems a mooted point. Can you pick out the veteran in this picture? But returning to that portable library in our heads, and returning da capo to where we started. Somewhere near the middle of the 20th Century, a U.S. Navy pilot was captured and imprisoned by the forces of the country they were bombing. Their captors were none-too-restrained in their treatment of their prisoners, torture and physical abuse was part of that; but in-between that and the constant lack of control that all prisoners face, the prison was made up of small solitary cells with deliberate and extraordinary limits on communication between the prisoners. The design was to break their will, not just their bodies. The captured pilot was John McCain, who survived this and later went on to a long political career, but one thing that he said helped him persevere in his prison was another captured pilot teaching him a poem by Robert W. Service, essentially loaning out a book from the library of one prisoner’s head to the other. And the method of doing this was painstaking: a pseudo-Morse-code of taps on the wall of the cell that the prisoners devised. Robert W. Service poems would fit well into taps, as his marching poetic feet can make one tap involuntarily—and the rhymes and narratives give a good structure to assist memorization too. Of course, this was a war prison, it wasn’t a graduate class in Modernist poetry, and if any of the prisoners might have known T. S. Eliot’s “The Wasteland” they might have skipped it if they couldn’t add the famous published edition’s footnotes in tap codes. Other than Service’s poetic aids to memorization that let his poetry be present in these solitary cells without possessions, another reason that it should be a poem of his that helped these prisoners endure is that some of Service’s best-known poems are about fatalistic endurance leavened by dark humor. Service’s poetry wasn’t just available without paper, it shared an outlook that helped sustain the prisoners. 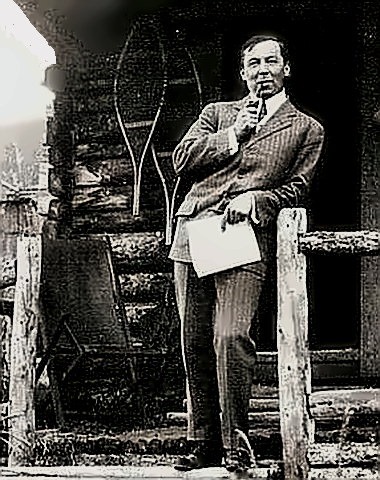 Canadian poet Robert W. Service, not essaying a look that Leonard Cohen would own up to. So that’s one veteran’s story from a war, decades after WWI. Here’s another. While McCain was imprisoned, another Navy veteran went into a studio in New York City and recorded an LP of Robert W. Service poems set to music. * While Service’s pre-war “Canadian Kipling” poetic style hadn’t changed, the outlook of the poems used in this record included Service’s rage at the horror and lies of WWI. Robert W. Service didn’t become a Modernist poet, but he showed in these poems the same WWI impact that broke other pre-war poetic outlooks. The veteran in this case was “Country Joe” McDonald, and even if these Service poems talked distinctly of WWI and the British, French and Canadian experience of it, McDonald no doubt intended it to reflect on the then ongoing war in Vietnam. 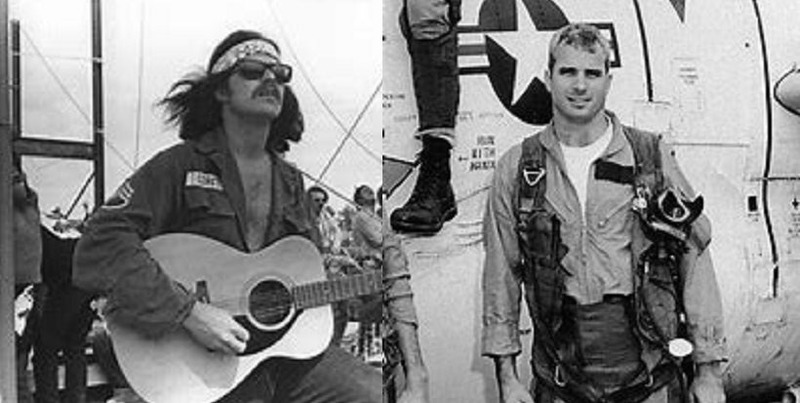 Of course, there were poems written after the WWI era about war, and McDonald had already tossed off one of the most famous Vietnam war songs himself: “I Feel Like I’m Fixin’ To Die Rag. **” And yet, here he was, drawn to these poems about World War I to express something decades later. *The record War, War, War largely draws on Service’s Rhymes of a Red-Cross Man which was published in 1916. McDonald’s record is a true solo record, just acoustic 12-string guitar, vocals, a bit of harmonica, and some foot-stomping; a straightforward, earnest, and harrowing collection. Parlando Project voice Dave Moore owned that LP, part of the reason he performed today’s Robert W. Service piece. My snarky comment on Service’s picture outside the snowshoe log cabin was perhaps too vaguely trying to contrast with the picture of Carl Sandburg with his acoustic guitar in my previous post. I can’t be sure, but I suspect Cohen and those who he considered his peers and mentors in Canada probably considered themselves in opposition to Robert W. Service, as the generation that should convince the world that Canadians could be as culturally mid-century modern as any other literature. Someone like Carl Sandburg could have connected through Cohen’s youth summer camp folk-song background. Cohen cosmopolitan stance was there from the beginning, while Service’s “brand” was the rough from the far north provinces, so of course his picture has the rustic cabin with the snowshoes by the door.. But of course, it gets weird with these three when the pendant in me starts to consider the details. Service spent most of his life in France, including years in Paris. Cohen may have that urban presentation, but there were Cohen’s years in a log cabin in the hills during his Zen monk time after all. Sandburg would dip into dialect in some poems along with his transcriptions of immigrant working-class speech, and some of the dark jokes that Service used would have fit in some Sandburg. That sort of thing probably poisoned Sandburg’s academic literary reputation in the past 50 years, but Service of course never had any academic literary cred to lose. I did pick up on the connection between the two captions and thought that, if Sandburg’s channeling Cohen’s soulful folk singer side, then Service is channeling his suit-loving Ladies’ Man side. But you’re right, it’s hard to think of poets who, suits aside, are more different than Cohen and Service.